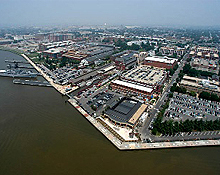 Naval District Washington's Headquarters is located at the Navy Yard. The Washington Navy Yard is located in Washington, DC. It is in the Southeast quadrant of the city. The mission is to sustain combat readiness through effective and efficient shore installation management and support.